The ghostly aura around the lettering is perfect. An otherwise great cover ruined by all the trademark crap. Couldn’t they have put that on the back? 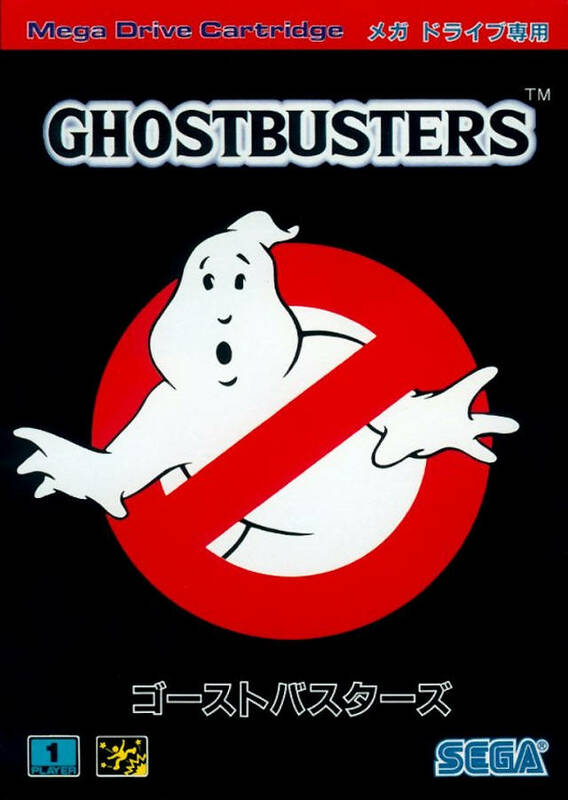 I ain’t ‘fraid of no ghosts, but I’m positively spooked by the Ghostbusters’ video game track record. 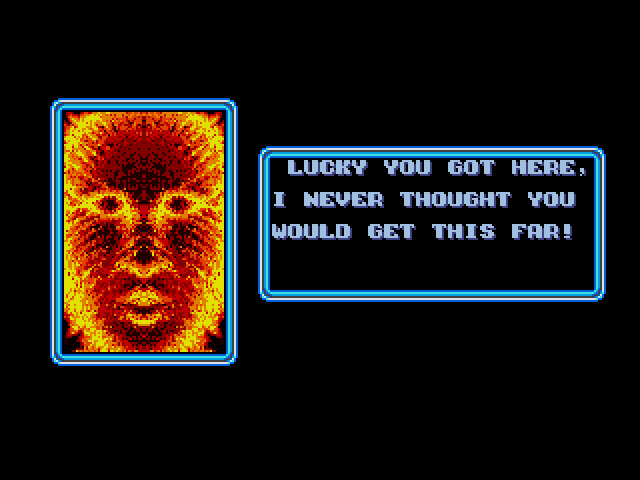 The 1984 computer game was one of the worst movie-based titles not published by LJN, thanks to a focus on running errands versus busting ghosts. 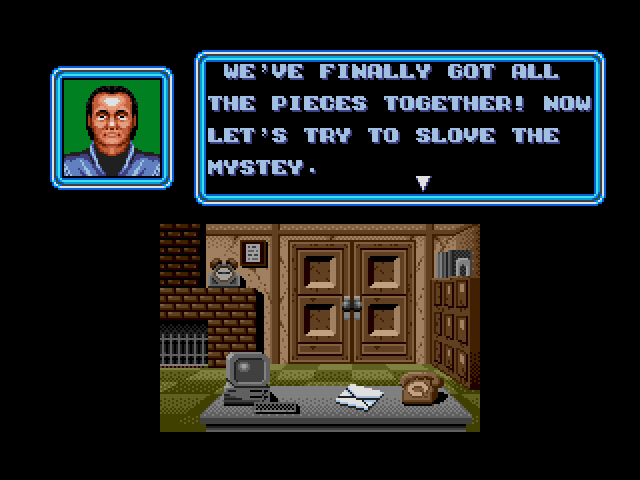 Because the movie was such a hit, so too was the game, and thus it was ported to just about every computer and console of its day, including the NES and Master System. 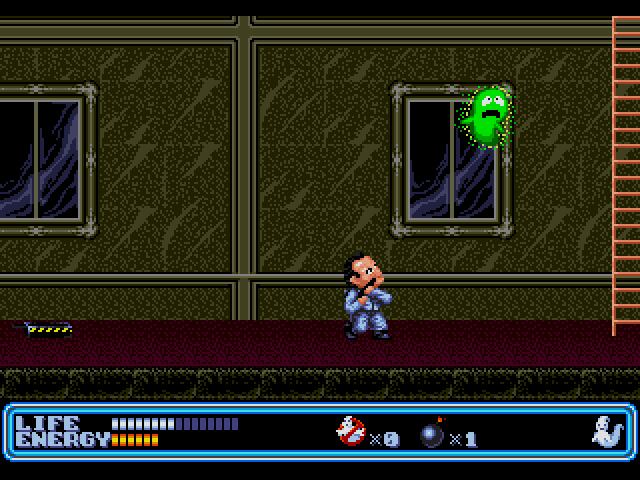 Ghostbusters II on the NES has extreme difficulty and janky controls, though at least it tries to focus on ghostbusting. 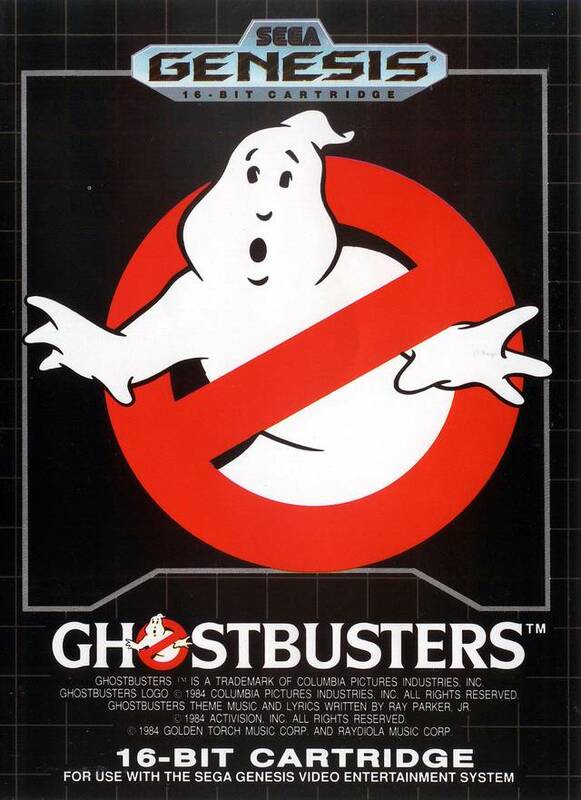 New Ghostbusters II was the one good Ghostbusters game to come out during the 8-bit era, but it was only released in Japan and Europe, not America. Ugh. Don’t start with me, game. 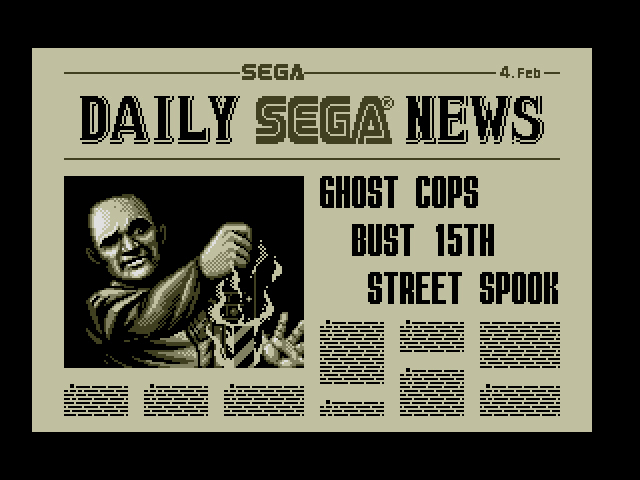 In light of the franchise’s beleaguered past, Sega’s Ghostbusters is a sigh of relief that succeeds by focusing on what fans want. Rather than waste time by filling up the Ghostbuster’s car with gas or wrestling with shoddy mechanics, you explore buildings across New York to trap ghosts both small and large. Ghostbusters even features an original story, with Ray, Peter and Egon (RIP my favorite and yours, Winston) about to go broke from the lack of ghosts in the city. Suddenly, several mysterious earthquakes occur, and the phone starts to ring again. Ghosts are everywhere, including the resurrection of the Stay Puft Marshmallow Man and an evil woman named Jenna, calling herself the god of death and destruction. The boys are back in business! Not the most intimidating spooks. Even their mini pickaxes are adorable. 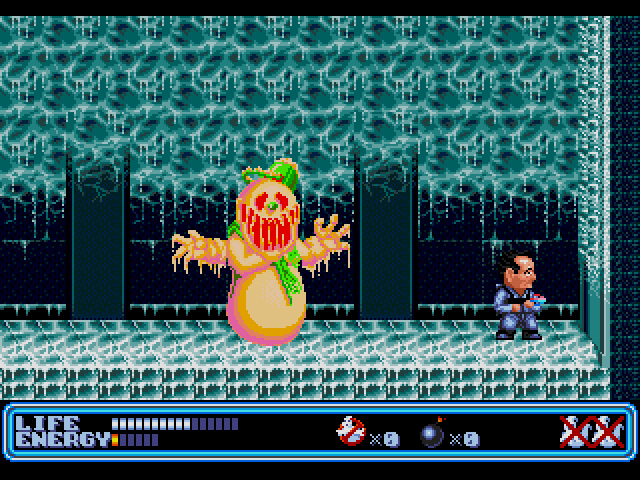 Ray, Peter, and Egon are the playable characters – rather, caricatures, since they all look like exaggerated cartoon versions of themselves. Be mindful about who you pick. Once you choose one of them, you’re stuck with them for the rest of the game. Peter has average speed and strength, making him perfect for beginners. Egon is fast, but weak, while Ray is tough, but slow. If Winston was in the game, he’d have top speed and god-like strength; shame he’s not an unlockable character. 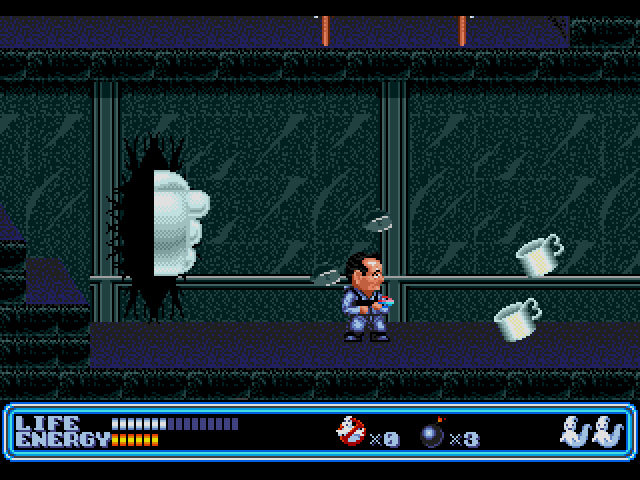 Stay-Puft is not impressed with Dr. Venkman’s cooking skills. Once you choose a Buster, you can pick between four cases across the city, each with a different reward amount. Each case is set in a building – house, apartment, high-rise – all of which have several paths that require a bit of non-linear exploration to find and trap the ghosts. These are not your typical 1500 sq. ft houses or two-bedroom apartments. You’ll be climbing up 20-ft high ladders, jumping on rotten wooden platforms over fiery pits, traversing over frigid ice water. Even without the ghosts troubling the places, I’m not sure these buildings are up to code. Pretty sure most homes shouldn’t have built-in prison cells. Your Buster is only equipped with a Normal Shot and three bombs, but as you earn money from trapping and destroying ghosts, you’ll be able to purchase better hardware. There’s a lot of needless, expensive equipment in the Weapon Shop, including a $10,000 Explosive and a $35,000 Barrier. I found the affordable Bubble Projectile, Phaser Shell, and 3-Way Shot to be the most helpful weapons for destroying the stronger ghosts. The Item Shop is also useful for replenishing your bomb supply, stocking up on delicious Peking Duck, or purchasing a handful of Infrared Scopes for darker levels. Not my kind of jawbreaker. Throughout your investigations, you’ll encounter Middle Ghosts, strong mid-bosses who must be destroyed in order to reach the final boss of each area. The Middle Ghost sprites are all flawlessly designed with superb animation. The nightmares include a headless ghost with a gnarly chihuahua demon emerging from his top hat, to an icy diamond creature, to the Grim Reaper himself. Your words of terror amuse only yourself. Once you’ve taken the Middle Ghost down, a booger ghost known as the Spectre Spirit appears and tries to flyaway from your character. Your weapon then turns into a beam which can bring the ghost down into the already placed trap on the floor. This is trickier than it sounds. If you don’t time your zap just right, you risk the ghost escaping and running away. While this running away doesn’t prevent you from beating the level, you do miss out on extra cash if you don’t catch him. Destroy all the Middle Ghosts in an area, and the path to the main boss will open. The main bosses aren’t nearly as difficult as the Middle Ghosts to take down. Find their weak spot and fire until dead. Once they die, they’ll drop a piece of the Stone Tablet. Collecting all the Stone Tablets unlocks more of the story and two additional levels. Unfortunately, no password system means you’ll have to beat the game’s six challenging levels in one play session. And while the game generously provides ten continues, that doesn’t make Ghostbusters any less difficult. 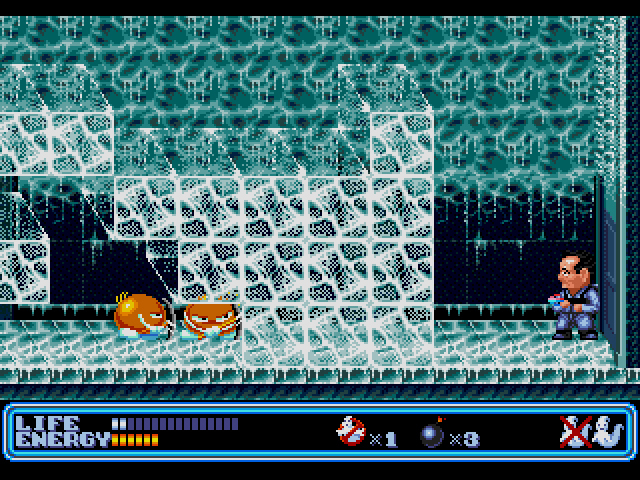 The Busters’ large sprites make it tough to avoid the smaller, nimbler ghosts. And, while the bosses all have set attack patterns, three hits by one of their attacks and your once long life bar will be decimated. Without your buddies, this is one tough battle. Weird that they found it necessary to rotate the logo slightly for the cover of the US release – it still overlaps its border, so squaring things up with a ~5px rotation just seems ridiculous. Absolutely agree with the preference for the clean-cover aesthetic! The character sprite style puts me off quite a bit to be honest, although I understand they would have done it to make the likenesses more obvious. Can’t say I’m likely to try this one out though, especially if it is a reasonably lengthy game with no save or password system – A Ninja Gaiden 15-20min game length is very attractive to me these days, or something I can fairly easily pick up and put down. Yeah, the lack of password system is a bit strange. It’s not the biggest game, but it does have considerable challenge, especially in the later levels. Very fun review to read. A couple of your quips had me chuckling. So I love this game. It’s one of those pre sonic Genesis games that was largely forgotten but is fantastic. It’s a great side scrolling platformer, has pretty interesting level mechanics and ghosts. Has really cool bosses. And has an interesting but not really nessesary story. You upgrade stuff I. The shops but it never gets overly complicated. For anyone worrying about length, it’s you standard length for a late 80’s early 90’s platforming game. It doesn’t need a password. No more than any othe side scroller of the era. I would recdomend this to anyone to play. Anyway at the time this came out, compared to an NES game , it looked stunning. Some of the boss effects are quite visually interesting. It really showed the difference 16-bit could make. Much more so than say Alex Kidd and the Enchanted castle. And really shows the evolving trend towards Castle of Illusion and then Sonic. 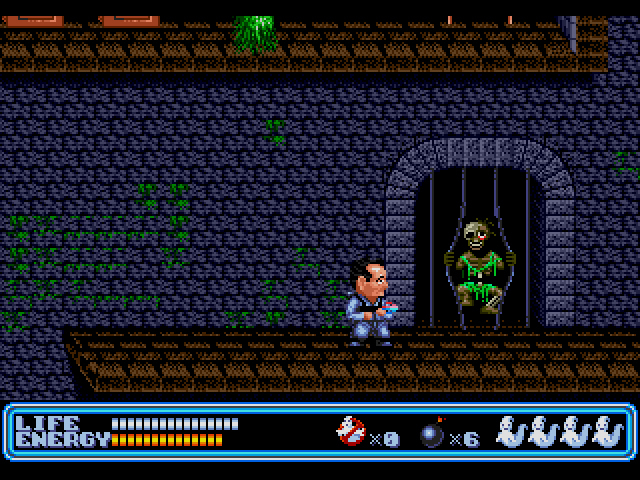 And Ghostbusters for the Genesis came out a few months after the vile Ghostbusters II for the NES. What a night and day difference! Thanks as always for the comment, Sean! Thanks, great article! I was not aware of this hidden gen, and I loved the Ghostbusters at the time. You got me curious with your tweet the other day about the game, and I’m happy that the review delivered:) Will try to look into it. I don’t comment enough but read these all the time – thanks for constantly bringing new perspectives to an old games library! Hey thanks Paulo, I appreciate your comment! Glad you enjoyed the review. 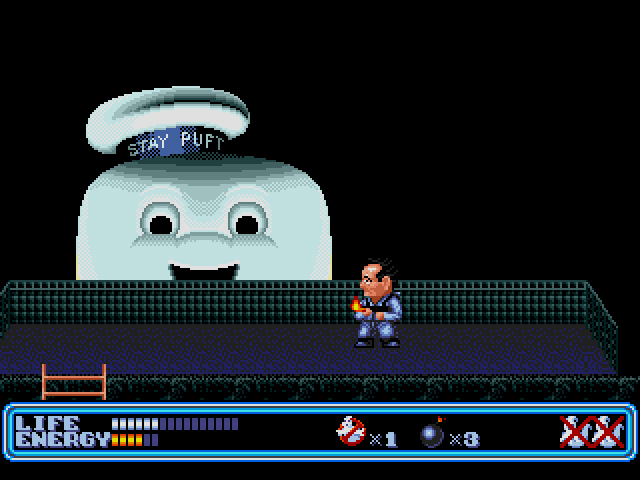 I didn’t have access to the hal laboratory game until my emulation days, so this has the distinction of being my only enjoyable ghostbusters gaming experience as kid. I vividly remember renting it and being real happy that it was nothing like the “other” two crappy nes games. And developed by compile, of all things. Definitely an interesting gem from the mega drive’s pre-sonic plataforming days. I always found it neat that the game has enough elements to feel like something from the ghostbusters franchise, while still doing an original story instead of just adapting the movies. It’s a shame that Winston didn’t make it in, but at least the other characters are actually recognizable. Yeah, this version often gets overshadowed by the two crappy NES games, unfortunately. So many people (myself included until I started doing this blog) forget that Sega put out decent stuff on the Genesis pre-Sonic. Hopefully I can raise a little awareness with these reviews! I absolutely love this game. It was one of the few I had growing up as a kid, and it’s was an absolute blast to play. The cartoony graphics are charming, the gameplay was tough but fun, and as a kid it felt like the game was super long too. Plus, having an original silly story is a nice little bonus too. 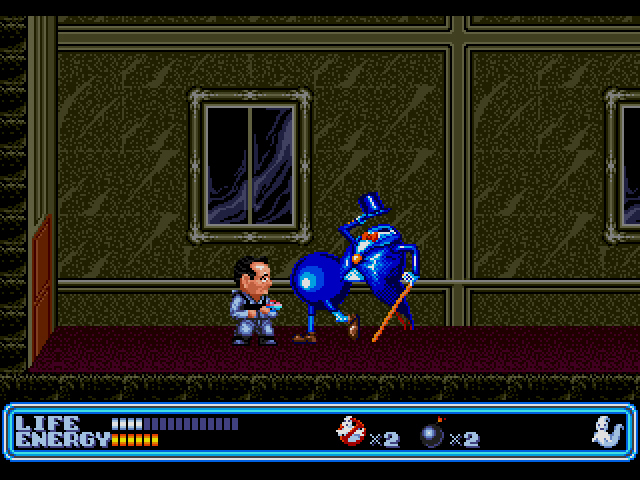 Incidentally New Ghostbusters II was ported to the Game Boy and that version was released in the U.S.
Woah, I didn’t know that! Thanks for the heads up.